A good mate Mick invited me to participate in his “15 Minutes of Fame Mix Series” which asks folks to submit shorter-form mixes. There are some great mixes posted there, several excellent ones by Mick himself. So, I thought I would start a new series of short-form mixes for 15 Minutes of Fame. “THC Series ” will be a series of 12 mixes, all 20 minutes in length. I thought it would be really interesting to do some mixes that were experimental or more offbeat than the normal fare for the Hydrogen Cafe. And, limiting oneself to only 20 minutes forces you to choose tracks more deliberately and also can offer you the freedom of exploring a single idea that may not work in a longer mix. I will intersperse the THC Series  mixes with my regular long-form mixes throughout 2009. Maybe this way there won’t be months between mixes. ;) THC Series  will be cross-posted at the 15 Minutes of Fame site as well. Thanks for inviting me Mick! 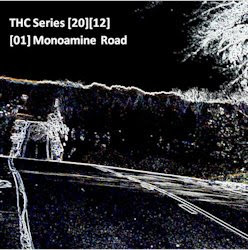 The idea for THC Series - Monoamine Road came from a small collection of tracks I have been putting together made up of unconventional tracks from conventional artists. I stumbled upon an ambient track of all things from Doves, an indie-rock band (one of my favorites). It’s from a collection of b-sides and rarities. I also had never, until recently, listened to David Bowie’s Low album all the way through and discovered the Eno-inspired ambient-like tracks towards the end. Those, along with U2 masquerading as the Passengers, Crystal Method, and excerpts from Amusement Parks on Fire and Snopek (a great local band from Milwaukee from when I was in college), and a few ambient tracks thrown in, make up Monoamine Road. I also threw in several field recordings, including one of my own. I would also like to remind people that the Zip file below contains artwork for the mix as well as the “score” for the mix which is a jpeg capture of the timeline from the mixing software I use, Acoustica MP3 Audio Mixer. The score can show you exactly what is playing at any specific time code. I hope you like this trip down Monoamine Road. "What's your road, man?--holyboy road, madman road, rainbow road, guppy road, any road. It's an anywhere road for anybody anyhow."